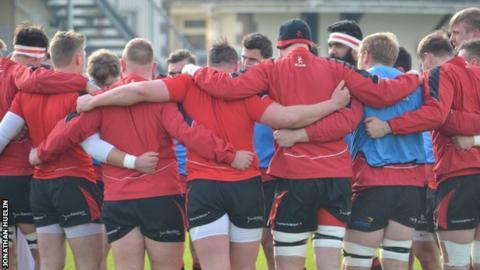 Ealing secured their Championship survival and ended Jersey's play-off hopes at Vallis Way. James Love, Alun Walker and Iain Grieve all claimed first-half tries to put the hosts in control. Nick Campbell went over for the islanders before the break though to give them hope. Jersey, needing a win to have a chance of making the top four, got further tries from Uili Kolo'ofa'i's brace and Pierce Phillips but it was not enough. The result means Ealing will play in the Championship again next season, but Moseley are relegated to National One. Meanwhile, Richmond have been promoted to the second tier. Jersey's pack, normally so impressive, had struggled in the early scrum exchanges with the islanders giving away frequent penalties. Winger Love went over in the corner to open the scoring midway through the first half, and former Jersey fly-half Jonny Bentley converted via the post. Lock Pierce Phillips was shown a yellow as a maul crashed to ground, and the 14 men could not keep Walker from powering over. Flanker Grieve got Ealing's third, from close range, as the home side opened up an imposing 21-0 lead before Campbell's try just before the break. Ealing were reduced to 13 men when Arthur Ellis and Adam Preocanin were sent to the sin bin for infringements at the maul. The islanders cashed-in as Tongan Kolo'ofa'i scored twice in quick succession to narrow the gap to 10 points. News filtered through that Bedford Blues had lost 28-24 at Doncaster, meaning any kind of Jersey win would take the play-off race down to the final weekend of the season. After a spell of pressure, Phillips went over and Cope's conversion made it 27-24 to set up a tense finale. Ealing were reduced to 14 men again when prop Will Davis was penalised for a further penalty at the maul. The islanders might have hoped for a penalty-try, but instead Love's kick at the other end sealed the win, ensuring Ealing's safety and at the same time Bedford's play-off spot. Ealing: Daniels, Crane, Howley-Berridge, Wheatcroft, Love, Bentley, Alex Walker, Davis, Alun Walker, Penny, Spivey, Preocanin, Grieve, Ellis, York (capt). Replacements: Kilbane, Lawrence, Rodman, Jones, Bradley, Davies, Ward. Jersey: Adair, Howe, Evans, Robling, Lane, Cope, Dudley, McCarthy, Buckle, Kerrod, Campbell, Phillips, Rae (capt), Freeman, Haining. Replacements: Herriott, Selway, Woolmore, Kolo'ofa'i, Graham, Fisilau, Penberthy.